Great gift for the watch collector on your gift list! 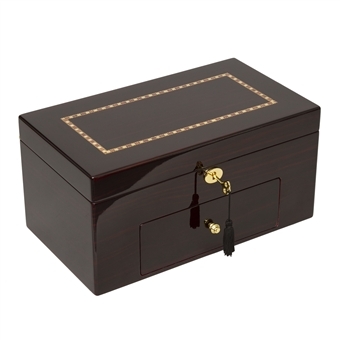 Size: Length: 13 1/4 x Width: 8 1/4" x Height: 3 1/2"
This is a fantastic Rosewood locking wooden watch box with wood inlay is for the watch enthusiast. 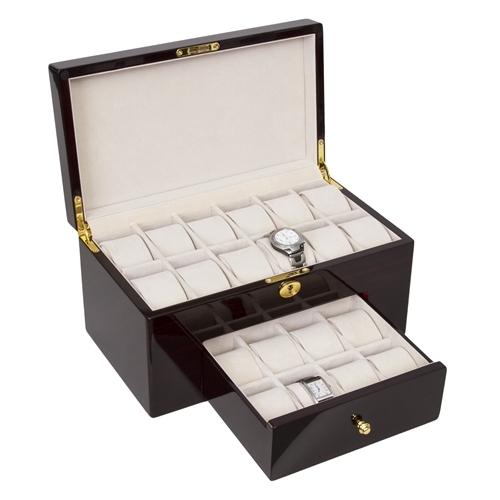 Storage for 20 watches in a 12 watch top with additional storage for 8 in a gliding drawer. For the true collector or His and Hers! A felted interior completes this watch collectors case. ChasingTreasure.com is an authorized dealer of all Jere Wright Global jewelry boxes and giftware. In business since 1978, Jere Wright Global, Ltd. is an importer and wholesaler of custom crafted giftware and jewelry related products. Their client list aptly communicates the quality of their products. Honored to be the primary giftware supplier of such major U. S. jewelry retail organizations as IJO (Independent Jewelers Organization), RJO (Retail Jewelers Organization), and SJO (Southeastern Jewelers Organization), and very proud to supply AAFES (Army/Air Force Exchange Service), PGA and the Smithsonian catalog. The Jere Wright Global extensive portfolio of giftware and wholesale pricing gives you a multitude of fine giftware options, sure to please on every gift giving occasion! Optional engraved nameplate available. See related products below.